The last few days were very meaningful for Gaia Dream Creation. 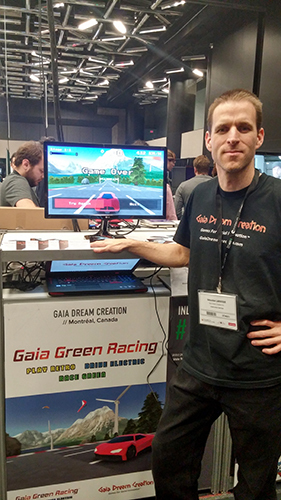 During the last months, I’ve been very busy preparing a presentation version of Gaia Green Racing for the MIGS 2016 (Montreal International Game Summit), which took place at the Palais des Congrès in Montreal on November 13, 14, 15. Here’s my postmortem of the event and what’s coming. 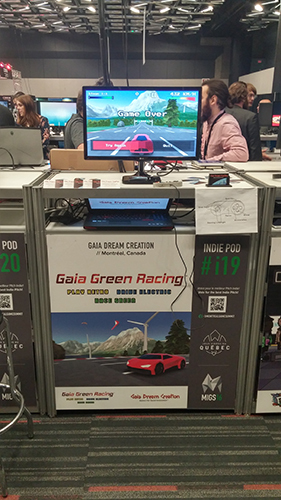 I presented a version in development of Gaia Green Racing. The last months were very demanding for me to adapt this version for the MIGS. Because of the limited time, I had to choose what I was going to include in this version. I rewrote the procedural core to generate the tracks and I also defined the landscapes. 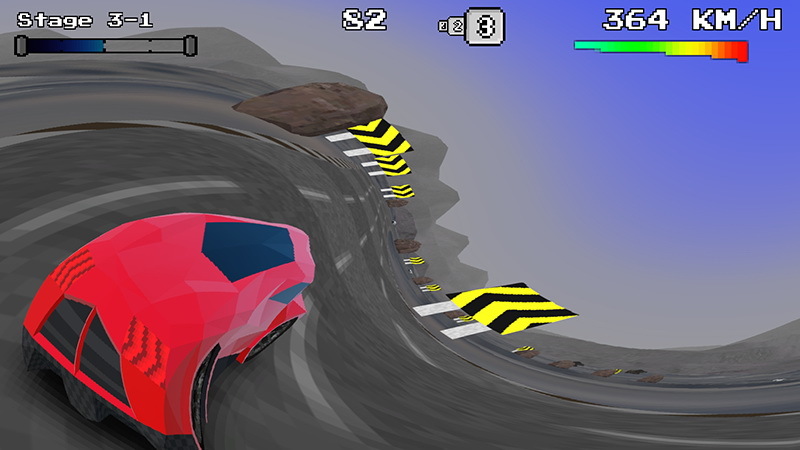 Before this version, several aspects were still coded temporarily to test the procedural concept of the racing game. The goal was to present the concept of the game in relation with social innovation. 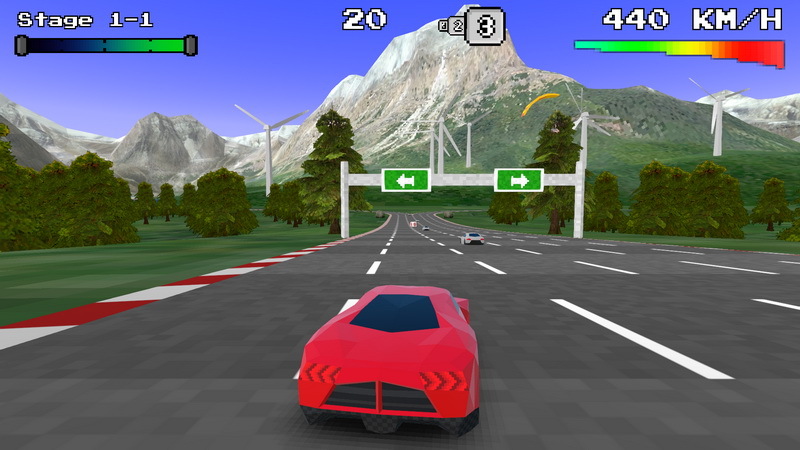 Gaia Green Racing is a racing game with retro graphic style happening in the future under the theme of renewable energies and social issues where the player drives an electric car. Apart from the concept where the player has to eliminate the other polluting cars from the road, I have presented two original elements: The use of cell phones while driving (SMS) and drunk driving. I proposed a concept in the game to illustrate the harmful effects and develop a mentality towards these phenomenons. Here are two screenshots that illustrate what happens when the player grabs these items on the road. The reactions were very good towards the elements that create a connection between the game and the social issues. The integration of these elements into the mechanic of the game was not something I had tested before the MIGS and it was difficult to anticipate the reaction of people towards the integration of these elements. 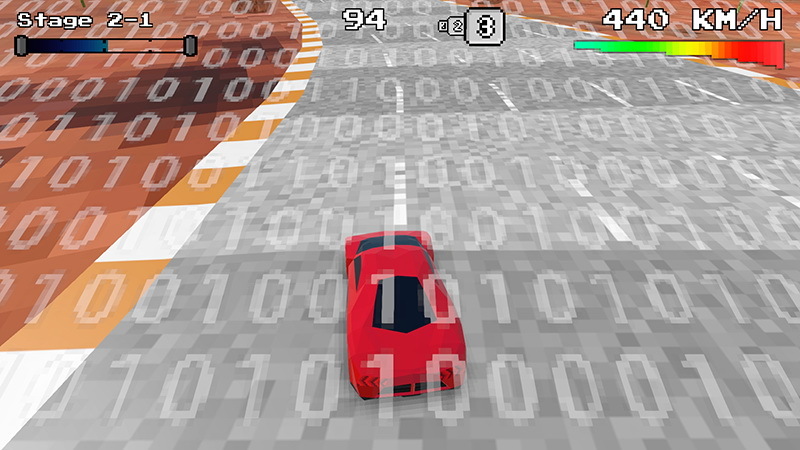 Creating a connection between a retro-racing game and a social phenomenon is a challenge. Presenting my game at the MIGS was an opportunity to do the real test with the audience and see the reactions live. Second day of exhibition and still alive after intense months of work, but which have been worth it. I also had the opportunity to interact with other Indie developers and industry people, for the majority of Montreal, on several topics of the industry. In addition, I created business contacts to help propel Gaia Dream Creation. The mood was really cool. Because of the unsustainable pace with the deadlines for preparing the MIGS and the game to be well defined before the event, I was looking forward to the MIGS being over a few weeks before the event. Once passed, barely an hour after the end on Tuesday night, I was a little nostalgic that it was already over. It’s paradoxical! 3 intense days followed by a calm. I had the impression that I existed only for the MIGS with the preparation. It was the disproportionate workload that was the main stress. Otherwise, the MIGS was great I plan to return next year with another game. I plan to participate in other local events to present Gaia Green Racing. I take a short break and I get back to work soon for the big launch in 2017. Thank you to all those who took the time to share their comments and impressions. I took notes. The MIGS was a success! First level in the national park.